Six shafts per package. Includes nocks and inserts. How Light Can I Go With Momentum TDT Arrows? 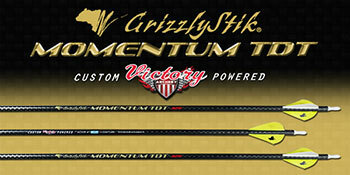 Introducing the new GrizzlyStik Momentum TDT arrows by Victory Archery - Thin Diameter Tapered carbon arrows! 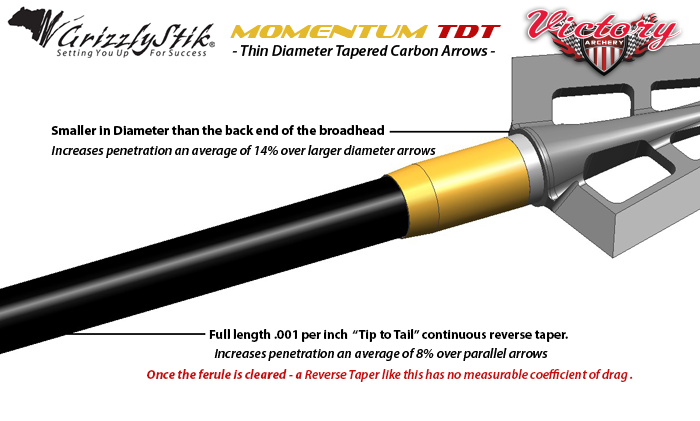 Thin diameter - thick walled - full length tapered arrows: The ultimate in; strength, accuracy, penetration, and trajectory. The Momentum TDT 170 is for heavy bows. Normally 80# up to 100#+ but can sometimes be tuned to 70# bows. Heavy bows shooting thin diameter heavy arrows with the right broadheads on board are big medicine for successfully bowhunting the largest animals in the world. Whether Elephant, Hippo, Cape Buffalo, Asiatic Buffalo, Giraffe or Brown Bear - The GrizzlyStik Momentum TDT 175 can do it all. Think of it as the .500 Nitro Express of Bowhunting equipment ~ without the recoil. • External Diameter Point End @ 30.5": .312"
• External Diameter Nock End @ .5": .280"
• External Diameter Insert Tip: .368"
We teamed up with Victory Archery with one goal - to make the best arrows for bowhunting we possibly could. These arrows had to incorporate all of our (GrizzlyStik's) required elements as well as those suggested by Victory Archery. • Provide the highest FOC (Forward Of Center) Potential of any other arrow - Approx. 5% FOC even with no nock or insert! With the GrizzlyStik Momentum TDT thin diameter tapered arrows, you get a broadhead delivery system with built in FOC (Forward of Center) balance points of at least 20%, when loaded up with a 200 grain broadhead. Bowhunters now can truly have ONE ARROW that can provide lethal penetration - Pass Throughs and Bone Breaks - On all big game animals in North America and all African plains game animals up to and including Eland. Settle on your set-up. Tune your bow to the GrizzlyStik System - and have one arrow for every big game animal in North America! Beware the man with one arrow set-up for he very well may know what he is doing! 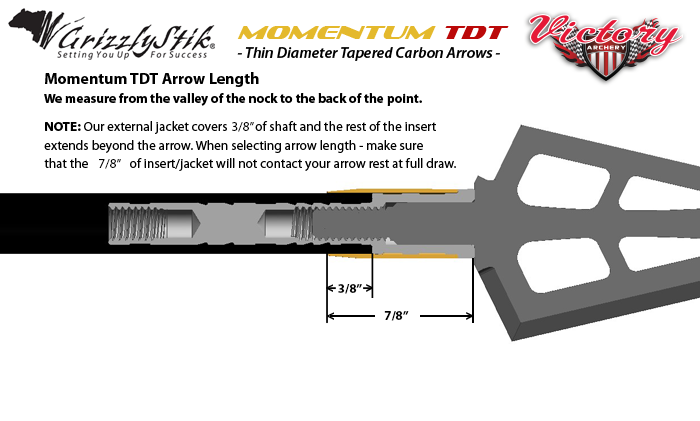 With the new Victory Momentum TDT thin diameter tapered arrows - you can do it! Note: You don't HAVE to shoot a 200 grain broadhead. Some bowhunters shoot much lighter broadheads. If this is you - you STILL need to look at the Momentum TDT arrows, they will give you MUCH better penetration than your current arrows - even when you use non-GrizzlyStik broadheads. If you take your bowhunting seriously - test the Momentum TDT arrows yourself - They give you more strength forward, weight forward, and spine forward. The fly more accurately at longer ranges, they group more consistently at longer ranges, and they are WAY less susceptible to wind drift! Whether you shoot our broadheads or some other brand - With GrizzlyStik Momentum TDT arrows behind your broadheads your set-up will penetrate better than ever before! 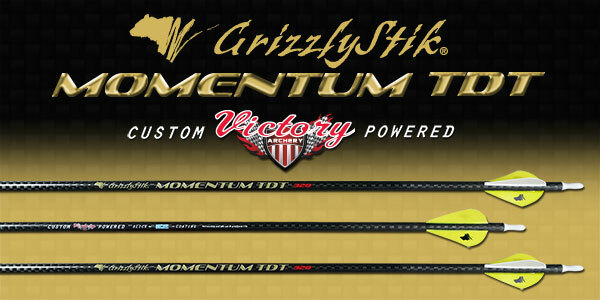 The new GrizzlyStik Momentum TDT full length tapered carbon arrows from Victory Archery are a game changer - you owe it to yourself to try them and see the difference. Momentum TDT arrows offer the optimum ratio of mass weight to stiffness for arrows that live to zip through anything that gets in their way. In short, no matter how fast your compound, (or traditional bow for that matter) if you’re looking for the ultimate, “one arrow that does it all”, fill your quiver with Momentum TDT tapered carbons and hunt with confidence, knowing that you’re shooting the best there is. GrizzlyStik Momentum TDT's come standard with Bohning A-nocks, and the new factory bonded aluminum and brass jacketed outer sleeve insert system. Note: All current stock GrizzlyStik Single Bevel broadheads are Right bevel heads. Maximize penetration! For amazing pass-through power like you’ve never seen before, shoot hard-hitting GrizzlyStik Momentum TDT arrows by Victory Archery. 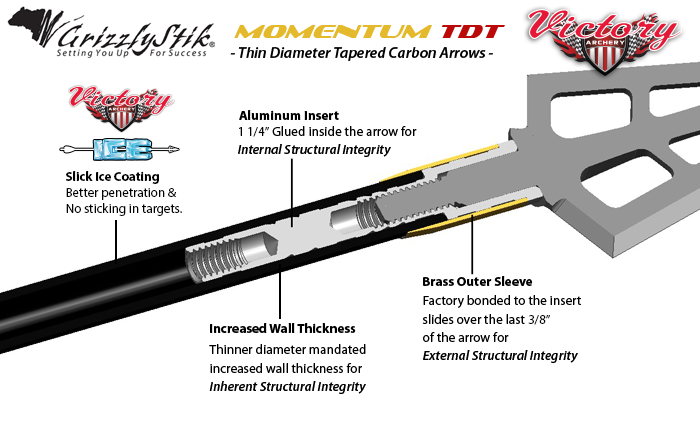 The proof is in the shooting, (and the science that backs it up) with GrizzlyStik Momentum TDT arrows you get all the penetration advantages of; weight forward, strength forward, and spine forward; including built-in Ultra-Forward of Center potential.